(CNN) -- Video of a fresh-faced Susan Boyle confidently singing a Barbra Streisand track to a room full of football fans in 1984 has been unearthed. 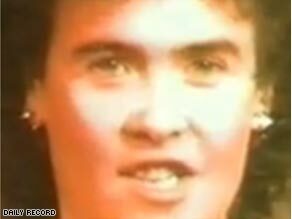 Susan Boyle as she looked during a performance filmed at a Scottish football club in 1984. The "Britain's Got Talent" singing sensation, looking trim and a bit like Abba's Anni-Frid Lyngstad, is invited on to the stage at Motherwell FC's Fir Park Social Club to take part in a singing competition between rival fans by a man wearing a checked coat and bow tie. Boyle, who had to wait 25 more years to be catapulted into the spotlight via her television appearance in front of Simon Cowell last month, quickly chats with the band before they launch into a low-key, lounge-style version of Streisand's "The Way We Were." When she finishes, the crowd breaks into rapturous applause and Boyle gets a peck on the cheek from the MC before slipping quietly back to her table in the smoke-tinged room. The video became public Friday after it was handed to Scotland's Daily Record newspaper. "I can remember that she was a shy young girl, but also very attractive back then -- she turned a few heads when she came into the club. "Even back then, I don't think anyone expected too much from her because she was so shy, but when she began singing people took notice." She famously told the show's hosts that she had never been kissed and lived alone with her cat in Blackburn, West Lothian, Scotland. The world's media beat a path to her home, from where she even appeared on CNN's "Larry King Live." Boyle has been installed by bookmakers as the favorite to win the show which, as part of the first prize, includes the right to perform in front of the queen.